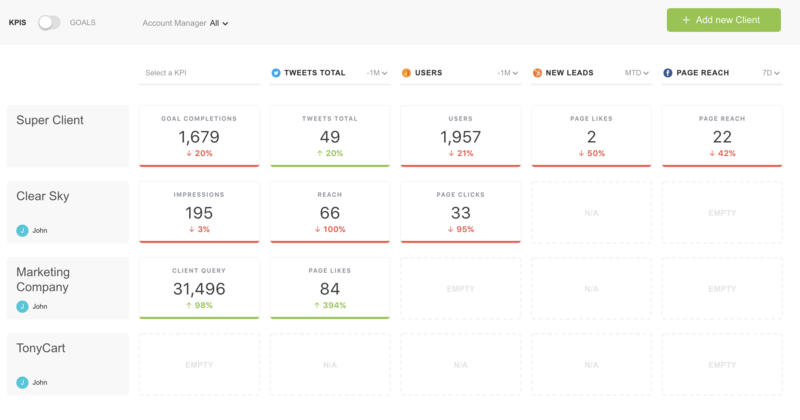 The Client Performance Screen is the easiest way to track critical KPIs, across all of your clients, on one screen. It allows an agency to monitor up to 5 KPIs for each client. 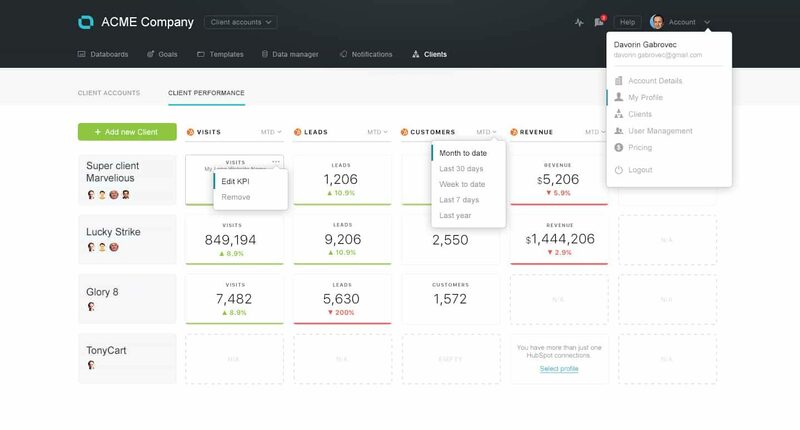 Simply open the “Client Performance” tab to open a dashboard that tracks all of the key metrics for your clients, from any connected data source. At the top of the page you can also switch between "KPIS" and "GOALS". On the far left column, you’ll see all of your connected client accounts listed. Each subsequent column after will consist of whatever metrics, from any of our sources for all client accounts. Atop each column, you’ll notice a dropdown where you can choose the metrics and data source you’d like to track, as well as the time interval for which you’d like to track it. Once chosen, that data will automatically populate for all the clients you’ve added to your Client Performance screen. 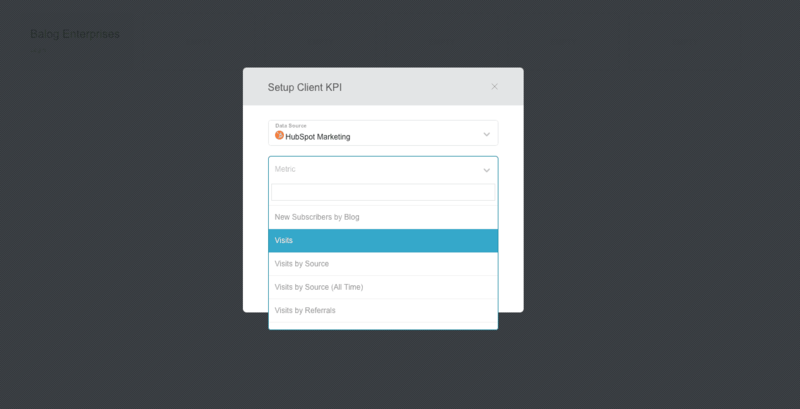 For example, if you choose to track “visits” from HubSpot (as seen in the image below), the data will populate for all the clients that you’ve included in your Client Performance dashboard under the “visits” column. If some clients use Google Analytics to track traffic, while some use HubSpot, you can customize this screen accordingly. To choose which metrics to show for each client, just change the metric for any of the individual squares. Client Performance works with any data source currently integrated with Databox. To add a specific Dimension to the selected Metric, you must type if in as an exact match. 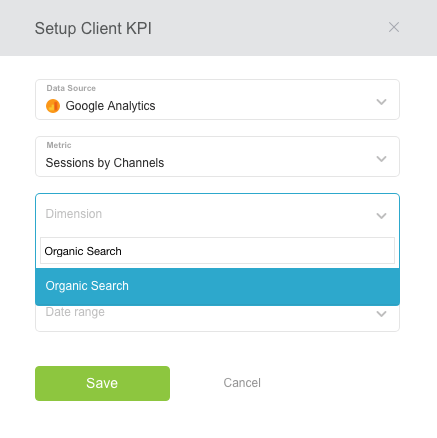 For example, if you set up a KPI using Google Analytics as the Data Source, Sessions by Channel as the Metric, and Organic Search as the Dimension you must type of "Organic Search".